A first half hat trick from Jack Jepson was followed up by goals from Courtney Hastings and Liam Corrigan to give Gedling Miners Welfare a comfortable win against struggling Borrowash Victoria at the Anderson Electrical Arena on Saturday afternoon. The visitors travelled to Derbyshire following a draw against Heanor Town last weekend and were unlucky to take only a point from a game they dominated throughout. Looking to settle any pre-apprehensions in this bottom-of-the-table clash, Gedling made the perfect start when, after only 3 minutes, they took a deserved lead. Following a commanding header from Martin Holt to thwart a hopeful punt downfield, Joe Meakin picked up the pieces in the middle of the park and his astute pass found the clever movement of Jack Jepson and the striker made no mistake in slotting the ball past home custodian Lewis Soal to give his side an important go ahead goal. 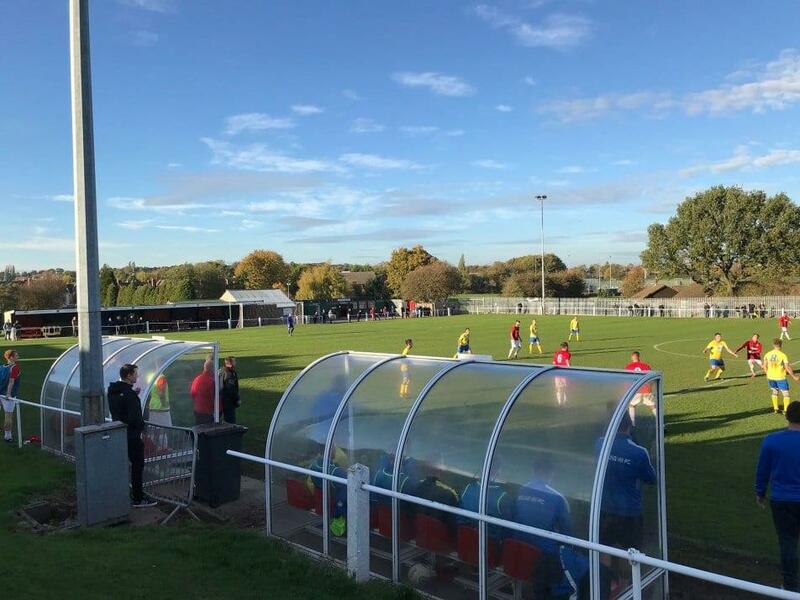 Having experienced a torrid time so far this season, Borrowash welcomed Gedling hoping to close the gap on their opponents to 1 point as both sides look to fend off relegation danger in the East Midlands Counties League. They responded well to going behind and after the tricky Tristan Matthews did well to avoid Ross McCaughey’s challenge, his pass found Travis Comery, however the midfielder’s effort was straight at visiting ‘keeper Danny Brown. 2 minutes later and Josh Matkin’s direct run down the right wasn’t dealt with and his excellent pull back to the edge of the area was picked up again by Comery but his improvised volley narrowly skimmed the far post with Brown rooted as Vics sensed a prompt equaliser. At the other end and Gedling should really have doubled their lead. A short corner routine between McCaughey and Jepson was well executed and the former’s superb cross found an unmarked Liam Corrigan but he couldn’t keep his unmarked header on target as the ball sailed over the crossbar from 6 yards out. Looking to emulate last week’s performance against Heanor, Gedling began to take control of the game as Borrowash struggled to cope with their intricacy in possession on a very testing playing surface amidst recent frost and rain. To their credit, the home side continued to play some neat stuff, as seems the trend under the management of Marc Sergeant, however, he would have been unhappy with how Gedling’s second goal came about 19 minutes in as, through their own undoing, Miners made it 2. An innocuous short goal kick found Josh Claxton-Briggs but following some hesitancy on his own byline, his intended pass to full-back Sam Mckay was intercepted by Jurgen Charlesworth and his square pass found the onrushing Jepson who slammed the ball past Soal before wheeling away in celebration as the Borrowash inquest began. Having lost 2-0 to Vics at Plains Road earlier in the season, Gedling looked good for their lead and weren’t happy to consolidate their cushion as they continuously pushed forward looking to put the game out of sight. Just after the hour, Meakin’s wicked free kick fell to Holt but he could only flick the ball onto the outside of the post before the ball was frantically cleared. 4 minutes later and Jepson’s commanding run from deep went undeterred and after his dangerous cross found Charlesworth at the back post, his volley was wonderfully tipped around the post by Soal who prevented Gedling from extending their lead. The dominance continued as the travellers looked to avenge the result of the reverse fixture in September and they looked good for the 3 points 10 minutes from the break when they added a third. Following another set piece, this time provided by Luke Smith, Borrowash failed to clear their lines and after panic ensued in the home penalty area following some uncertainty, Jepson’s speculative overhead kick was fantastic and the ball looped over Soal before nestling into the bottom corner to notch a superb hat trick and a 17th goal in all competitions this season. He may have added a fourth 3 minutes before the break but his snapshot from an angle, after some impressive build up play between Charlesworth and Jimmy Spiers down the left, was palmed away by Soal at his near post. Not looking to rest on their laurels, Gedling began the second period from where they left the first and resumed their attacking intent and the half was only 35 seconds old when the visitors recorded a fourth. Regaining possession from kick off, Charlesworth’s pinpoint pass out wide found Courtney Hastings who did well to deceive Jack Fetherston on the inside before nonchalantly curling his effort into the top far corner to put the game to bed and ensure the much-needed 3 points headed back to Mapperley. By this stage, Gedling were in complete ascendancy and may have been a question of how many rather than whether more would be forthcoming. 5 minutes after the break and after Meakin had created some room to fathom an effort from range, his shot was straight at Soal who clutched the ball gratefully to his chest. 2 minutes later, Jepson continued to cause endless worry for the home defence but his shot flashed just wide after he did well to deceive Danny Myers. Shortly after the hour and Borrowash, who were enjoying a promising spell of possession as they looked for any form of consolation, had their best chance of the game. After the promising Matthews had danced around 3, his passed effort was saved well by Brown and as the ball fell kindly to Jordan Carr the striker could only spoon the rebound onto the foot of the post before the danger was fully averted. Not long after and Matthews may have added a deserved goal his performance had warranted but after he was put through on goal by former-Miner Tristan Comery and having rounded Brown, the retreating Holt was on hand to block his shot and clear as Gedling’s clean sheet remained unblemished. The game quietened with limited chances throughout the second half as both sides accepted the outcome of the result as Gedling extended the gap over Borrowash to 7 points in the table and they rounded off an outstanding afternoon a minute before time when they made it 5. An accurately delivered set piece on the far side from McCaughey found the left-alone Corrigan who had the simple task of nodding home to score his 2nd of the season to cap of a fine personal performance from the defender who was excellent on the day. An important win for Gedling who fully deserved the 3 points as they leapfrog Rainworth Miners Welfare in the table and a brilliant performance to match. Their attention turns to Nottinghamshire Senior Cup action on Tuesday night as they make the short journey to face Clifton All Whites looking for a place in the quarter finals, kick off 7.45pm.